The Asantehene Otumfuo Osei Tutu II has commended Vodafone for finally getting a Ghanaian Chief Executive Officer (CEO) to steer the affairs of the company. Last month Vodafone announced that Patricia Obo-Nai, Director of Customer Operations and Fixed Business, will replace Yolanda Cuba as Chief Executive, effective April 1st. Yolanda Cuba is returning to her role as Chief Strategy Officer at Vodacom South Africa, having completed her three-year assignment in Ghana. The delegation was led by Board Chairman Dr. Kobina Quansah, External Affairs Director, Gayheart Mensah and Human Resources Director, Ashiokai Akrong and other Vodafone officials from the Accra and Kumasi offices. 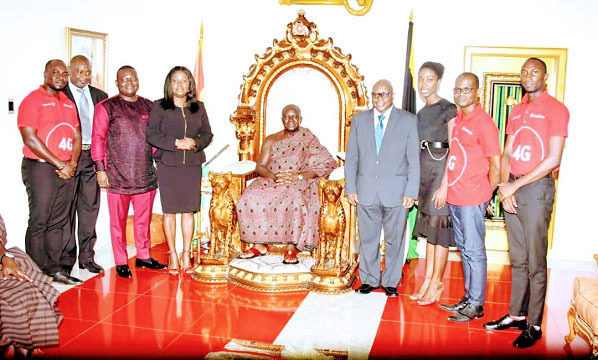 The visit was also to update the Otumfuo on the upcoming Asantehene Golf Open Championship, which Vodafone is the headline sponsor. This year’s tournament, which begins on May 8th, 2019, is expected to assume another dimension of prominence, as it coincides with the 20th anniversary of the coronation of the great monarch. A cheque for GH¢50,000 was donated towards the celebration of Otumfuo’s anniversary.